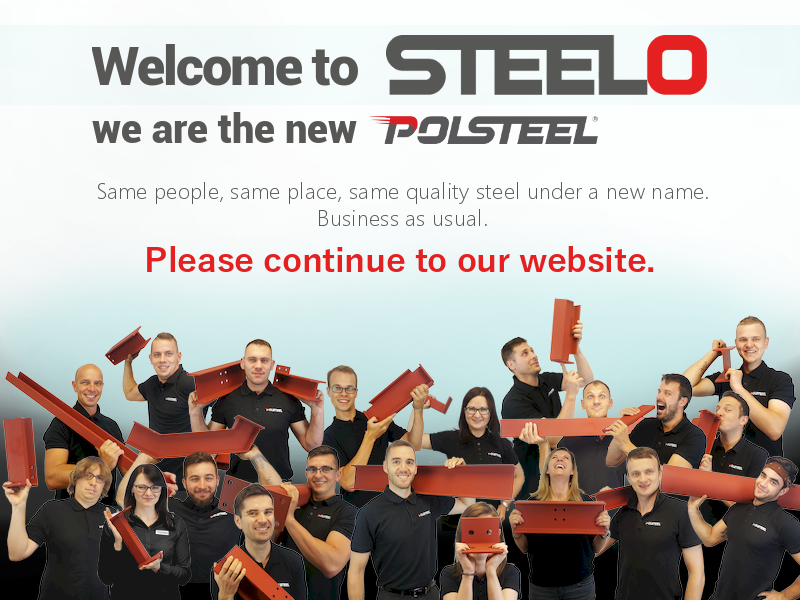 Here at Steelo, we are always making use of different types of bolts for different situations. Most of the time we use standard hexagonal bolts but we also use counter sunk bolts, hollobolts and HSFG bolts. HSFG stands for High Strength Friction Grip and as the name suggests they make use of friction. 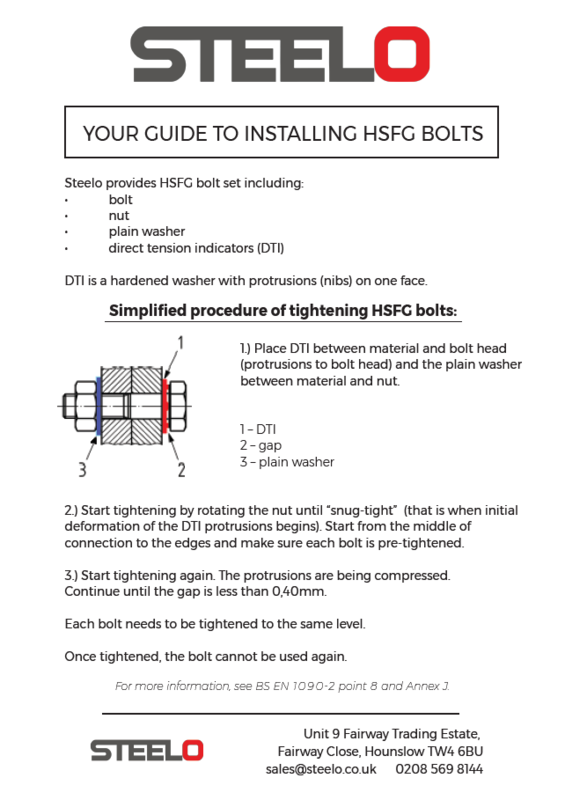 Where a traditional bolt will stop the plates in a connection from moving apart by supporting the weight on the bolt shank in the form of shear stress, an HSFG supports the weight by clamping the plates so tightly together that they can’t slip past each other. In other words, the friction generated between the plates is equal to the force being put on the plate by the weight of the beam it supports. To make sure that the plates don’t slip past each other, the bolt needs to be carefully preloaded. The area around the bolt needs to be clean and unpainted (which we make sure of whenever we use HSFG bolts), and the bolt then needs to be tightened to a precise level. In general, we include a DTI (Direct Tension Indicator) with the HSFG bolts that lets you know when the right tensions been reached. (The little bumps on the DTI will be compressed as the tension increases). We don’t use HSFG bolts often because they’re expensive and in most cases, they aren’t needed. There are a few cases when they should be used, most commonly for us here at Steelo, in splice connections. If it’s important that there is no slip between plates in your splice connection then we can use HSFG bolts to achieve that. 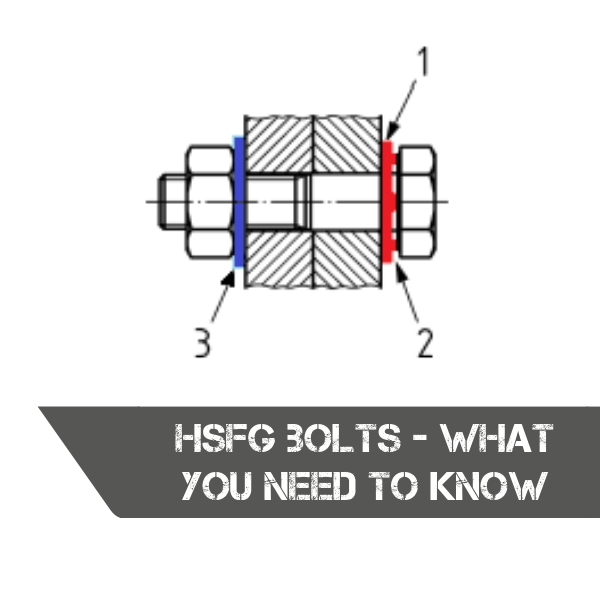 HSFG bolts are also commonly used in structures that will be exposed to a lot of vibrations, or loadings that will reverse. Since the bolts are preloaded the tension in the bolt doesn’t vary as much as in a standard bolt, so they don’t fatigue as quickly. They also will prevent any slip between the plates, which means your fastener won’t come loose. 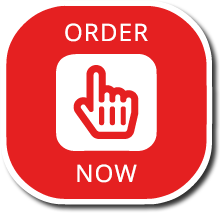 If you find yourself in need of HSFG bolts we will be happy to order them for you. They are more expensive and the lead times are a bit longer but for some applications, it’s worth having them. Just make sure they are carefully pretensioned according to manufacturer’s instructions and only used once! If you want to ask any questions about HSFG bolts, we will be happy to advise! Good afternoon, I’ve just spoke to someone but had a bad phone reception. I’m looking for some information with regards to tightening up some of your M12 HSFG Bolts. Looking for a “installation guide” data sheet please.